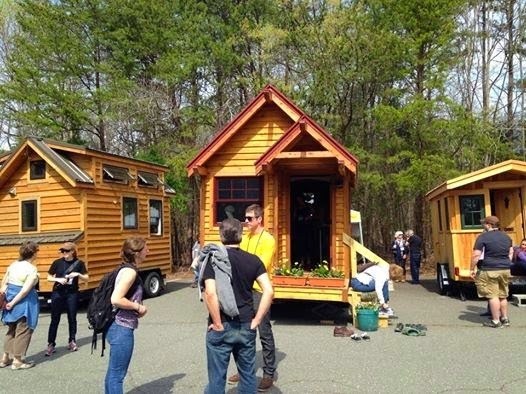 I am super excited about the upcoming Tiny House Conference. Matt and I spoke at the first event in Charlotte last April. It was pretty amazing. We got to meet some great people we had only previously known online. We camped in the cold along with Drew Odom and his dad. We spoke on two topics at the conference: Building Basics and Off Grid Living. We're excited to bring both of those talks back to the Portland event. Right before we leave for Portland we'll be in Gastonia, NC speaking at the Schiele Science Cafe. I've been to similar events in Atlanta and am looking forward to that as well. Matt and I enjoy telling our story. We believe that sharing our motivations, the process, and the results are an important part of the Tiny House process. We want others who may be considering such a bold move to understand that it is completely doable, even as a beginner like we were. We also feel that the message is important even for people who may not want to live tiny. We believe that Deliberate Living is a philosophy, not a type of building. We truly believe in what we're doing and want others to live as fully as possible as well. Speaking of conferences, I am also participating in a big conference in October. It has nothing to do with Tiny Houses, but my involvement wouldn't have been possible without our journey. A couple of years ago I began blogging for The NotMom, a website for women without children. I am childfree by choice and as I began looking for freelance writing jobs I came across quite a few companies looking for Mommy bloggers. I wasn't upset by the existence of mommy blogs, but wondering if there was an audience for women without children as well. Serendipitously, I discovered The NotMom and began working with them. And out of that, I am helping the founder develop the first ever NotMom Summit which will be in Cleveland, OH October 9th and 10th. I've always wanted to help organize a conference and without the steps I took to become a freelancer, including building a tiny house, it wouldn't have been possible.